The Lacandon people are one of the most isolated native groups in Mexico. Going completely undetected until the early 1900’s, this small tribe is giving scientists a unique look into the past Mayan way of life. Over just the last 30 years, this tribe of people has slowly been exposed to the world beyond their villages. Today, the Lacandon people only number about 650, yet their traditions are fascinating. During our Book of Mormon Cruises to Mesoamerica, we learn about the many similarities between the ancient people of Mesoamerica and those found in the Book of Mormon. The story of the Lacandon people is one such story. Professor R. Jon McGee has lived among the Lacandon people and has written a book about their oral history and their religious beliefs. 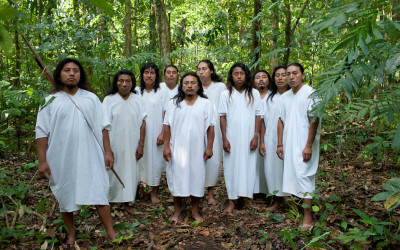 The Lacandon people believe in many gods. The Father God is Hunab Ku. The first born of this god is Sukunkyum. The literal translation of this name is “Older Brother, Our Lord”. It is Sukunkyum who will resurrect each human and judge them according to their deeds on Earth. The Lacandon people don’t believe in one Heaven and one Hell. They believe that after their judgment, each person will enter into one of “many layers in the sky” or one of many different heavens. The highest heaven is U Ka’ani K’uh, or Sky that Belongs to the Celestial God. The lowest heaven is ruled by the god Kisin, who is also a son of God, but has gone astray. The Lacandon people believe that “God’s family structure is like their own” in that they believe that family relationships exist beyond the grave. The Lacandon’s have a tradition of where they came from. They believe that their first family became involved in a feud. The older brothers (K’aak’ Bakal ak Yum Chak Xib and Paal ak Yum Chak Xib) rebelled against their father and tried to take his power. The younger brother (T’uup) honored his father’s will and was given the family birthright. T’uup became the “Master of Light”. The older brothers were banished to live in the wilderness. The translation of the names of these older brothers is very interesting. Yum Chak Xib translates to father of the Red Man. Both brothers carry this part of the name. The older brother’s name translates to Bitter Speaking Man, Father of the Red Man, while the other brother’s name translates to Younger Tongue, Father of the Red Man. Tradition states that before they were banished into the wilderness for their rebellion, the father cursed them with a dark skin. The Lacandon name is not of Spanish or Mexican origin. Mesoamericans would generally give themselves names to honor their kings. One Mesoamerican group had a line of kings named Pacal, Pacal II, Pacal III, etc. In Jacob 1: 11 we learn that the Book of Mormon people had a similar tradition, “And whoso should reign in his stead were called by the people second Nephi, third Nephi, and so forth…” Could the Lacandon’s be decedents from the people of Lachoneus? Lachoneus was a great Nephite ruler just before the appearance of the Savior in 3 Nephi. The mystery of the Lacandon people is fascinating, to say the least, for readers of the Book of Mormon. Join us on one of our upcoming Book of Mormon Cruises to the ancient Mayan world and learn of the rich history, religious beliefs, customs, and traditions of the ancient people of Mesoamerica that seem to correlate with those found in the Book of Mormon. Visit the Mayan cities of Lamanai, Tulum, and Chocchoben! Click Here for all the details, dates, and prices of our upcoming Book of Mormon Cruise.